When Square bought food delivery startup Caviar last summer, it seemed like a strange acquisition for the payments company. But over time it’s become clear that Square is committed to competing in the increasingly crowded food-delivery segment. Thanks to its recent acquisition of San Francisco-based food delivery startup Fastbite, it’s adding a whole new option to Caviar that will reduce the cost of meals and time customers spend waiting for them to be delivered. By doing so, it will compete more directly with local food delivery services like Sprig and Spoonrocket. Fastbite was founded with the idea of offering low-cost meal options — generally around $10 each — that could be delivered in about 10 minutes. Just like Sprig and Spoonrocket, it served up a limited menu of three or four items a day that could be prepared in volume and quickly shuttled to customers. Unlike those other services, however, Fastbite sought to partner with restaurants who would prepare those meals for it, rather than dealing with the fuss of running a kitchen and preparing menus itself. In that way, becoming part of Caviar makes sense, since the company already has hundreds of relationships with restaurants in San Francisco and throughout the country. 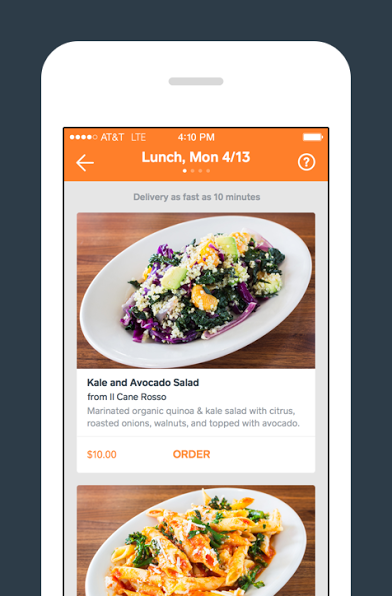 After joining Square a few months ago, Fastbite has been working on identifying the best local restaurants to work with and integrating with Caviar’s delivery service. Today, users in San Francisco will see the fruits of those efforts, and the Fastbite option becomes available in select neighborhoods in the city. When users open the Caviar app, they’ll see “Fastbite” alongside other restaurants listed near their location. The service will offer three or four menu options daily, which will be priced as low as $8 — including delivery — but never cost more than $15 per meal. To get those meals the company is partnering with different restaurants to create prepared foods that can be delivered quickly to local customers. According to Fastbite co-founder (and now-Square/Caviar employee) Avlok Kohli, the team used Caviar data to determine the best restaurants for a variety of different cuisines in its local delivery area. To start, they have chosen eight restaurant partners in San Francisco, each representing a different genre of food (American, Italian, Indian, etc.). It’s worked with those restaurants to create menus of options that will rotate daily based on the type of meal and popularity of cuisine. “Some of these restaurants are already doing a lot of volume with Caviar, and so they were open to this idea of creating custom meals for Fastbite,” Kohli said. Before users get too excited, however, it’s important to note that Caviar Fastbite currently only serves a very limited portion of San Francisco, mostly just SOMA and the Financial District. But given Caviar’s relationship with restaurants in the Bay Area and other markets, you can expect the company to ramp up both the neighborhoods it serves in SF as well as other major cities.